Apple Cider Vinegar is one item that no kitchen should be without. It not only provides a range of health benefits but it can be used in a wide range of tasty dishes. Health benefits include weight loss, increased energy, used to treat dandruff, aiding in blood circulation, treatment of arthritis and the list goes on. More importantly Apple Cider Vinegar is a versatile cooking ingredient which is used to make sauces, marinate meats, add a punch to cocktail drinks and more. Why not enjoy the health benefits while enjoying the culinary versatility! Apple cider vinegar is a tan to dark liquid which is watery and not viscous. It is sold in plastic and glass bottles. There may be a bit of sediment at the bottom of the bottle. 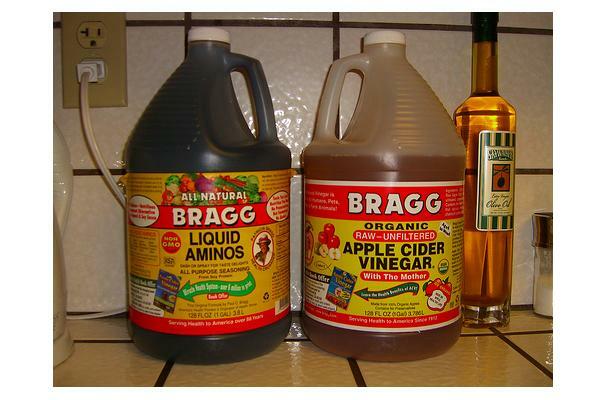 Choosing: When using in cooking, choose a vinegar that looks clear and light colored. For taking as a health supplement, you might want to consider an organic version. Buying: Apple cider vinegar is available in most supermarkets. It is also available in health food stores, gourmet shops, and farmers' markets. Use apple cider vinegar along with oil and spices if desired to make a delicious vinaigrette dressing. Apple cider marinade is very similar and can be used for pork and chicken. Apple cider vinegar can be made at home. It is made with either whole apples or apple cider and yeast. The yeast ferments the sugar in apples to alcohol, and in a second process, bacteria is used to turn the alcohol into acetic acid. History: Use of apple cider vinegar is recorded in Greek writings as long ago as 400 BC, where it was used for it's health benefits.